As a mom you better believe that I am a germ free freak, I am always trying to sterilize Valentinas toys or wash her hands, especially during the Fall and Winter season when all the cold and flu germs are around. One of my must have household items and even to carry around in my purse are the Clorox disinfecting wipes. Not only are they easy to use and dispose of, but they kill 99.999% of bacteria! They are perfect for killing those nasty cold and flu germs. You can feel safe when you clean the surface of a table with these Clorox disinfecting wipes because they kill the germs or bacteria that can live on surfaces for up to 48 hours. I love to carry some around in my bag and wipe down the table when we are at a restaurant or any toy that she might play with when we are at the toy store, this momma doesn't like to kid around. There's nothing worse like seeing your child sick. Little ones also have fun using them and can help you clean their toys, if you let them. Valentina loves cleaning her toys with me, it's something we like to do about once a week, It makes great bonding time, while she learns that it's good to keep her her toys clean and germ free. Remember that if you find your tub to be a little boring you can always spruce it up with a little washi tape and some fun construction paper. This is a great DIY project that also makes a great way to destress for a little bit while at home. You can head to your local craft store, Michaels, or Target and find some cheap washi tape, I always find some in the dollar section. Buy a bunch of stickers and some cute decorating paper. now go crazy with your patterns, have fun and most importantly do something fun while you make your home pretty at the same time. And before you start make sure to disinfect your working area with Clorox disinfecting wipes. Definitely something that I always keep handy in my bathroom and household. Make sure that your child always coughs into her arm, never out into the air where the germs can float out. It can be a little bit hard with the little ones. but patience and persistence goes a long way. If they have siblings, no kissing on the cheek while they are sick, just to keep the germs away. Always make sure to wash there hands after blowing their noses and always use a tissue. Hand sanitizer is always a must, especially when you have little ones and tend to travel a lot in public transportation. and last but not least, our handy dandy clorox disinfecting wipes. Which are available in three amazing scents - Citrus Blend, Orange Fusion, and Fresh Scent. All three smell amazing! Clorox disinfecting wipes are great not only for the flu and cold season but all year long, did you know that they also help kill Staph, E-coli, Salmonella and more. If you have yet to use Clorox disinfecting wipes, make sure that you run, yes don't walk to your local pharmacy and stock up. Fall is here and that means that winter is just around the corner, you want to make sure that your house is germ free. Make sure to follow Clorox on Facebook, Twitter, Youtube, and Pinterest. 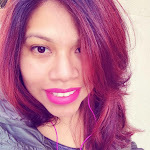 So that you are always in the loop on what new products are coming out and other fun stuff. Disclosure: This is a sponsored post. All words and opinions expressed are 100% my own. 25 comments on "Keep The Germs Away With Clorox Disinfecting Wipes "
I had no idea Clorox has disinfecting wipes. I always make sure to stock up on wet wipes. I am going to add this to my list. I have never heard of Clorox before and I love to discover new new products. I trust your review and I will definitely try it. We are a huge fan of Clorox wipes. We have a container in every room to keep germs away. This time of year is awful and this year especially we have had more kids down then normal! Clorox is awesome! They are handy dandy! I love Clorox wipes and I only trust their brand! They do a great job. I love using these. They make cleaning up a breeze! 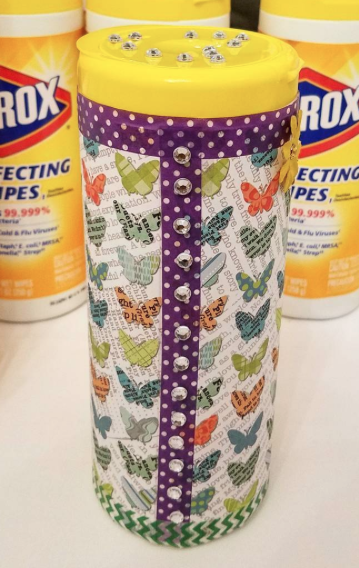 Clorox wipes are a must for this school teacher! I cannot imagine how many illnesses I probably prevented by using these daily! I like that clorox now has wipes like this! I always have wipes with me, in the car and in the bag. It's important to have one at home too. You can never tell with the kids! Awesome tips for keeping your kids safe from viruses and flu! I keep Clorox in my car...the bathroom...the kitchen...the laundry room....pretty anywhere with a surface that can be wiped down! I love this stuff! 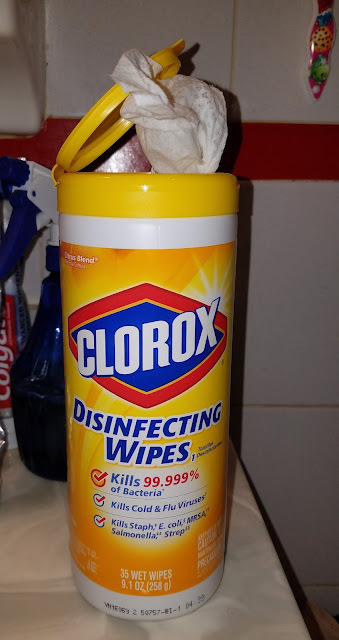 I've never heard of Clorox cleansing wipes before but I always use simple ones. They sound great. This wipes look perfect. As its flu season germs are breeding so this would be a great way of getting rid of the germs! 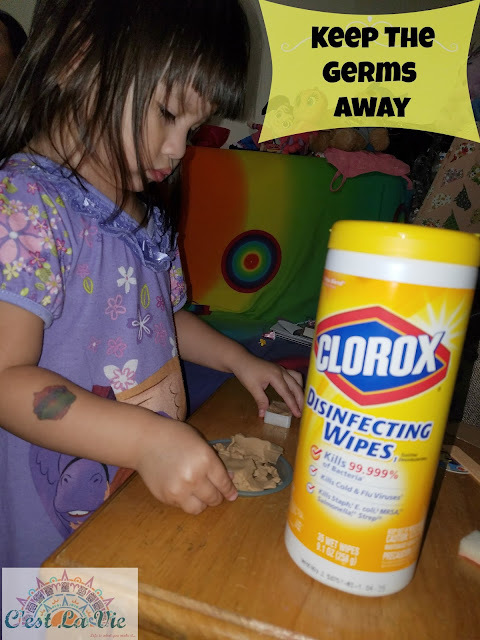 I love using Clorox wipes around the house for quick clean ups! I also love how you decorated it with the washi tape and construction paper - so cute! I should buy stock in Clorox. I use it all the time and depend on it for clean-ups and getting rid of any icky germs! I'm a huge fan of clorox wipes! I always keep them in my bathroom and kitchen for a quick wipe down! They're great for when guest show up unexpectedly! Every year we stock out kids' teachers with clorox wipes. They love and appreciate it. I love Clorox wipes. Definitely will need them this season because we have a newborn now! I actually have these wipes in my home. Great multi-use product to clean the home! I always have my own Clorox Wipe, especially when I'm in travel. It's important to disinfect ourselves by this wipes. I am pretty sure that I should own stock in the Clorox company with as many wipes as I use. I remember when they first came out! Love love love them!!! I swear by these wipes. I love them. I use them all the time to clean up messes around the house. 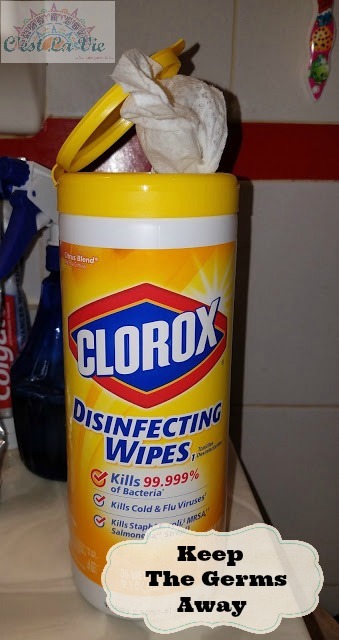 Clorox wipes are a great product. I love these wipes and need to grab more of them. We are out. Coincidentally, we have pink eye. Clorox is always our go to no matter what time of year it is. They definitely work to keep the germs at bay! It's that time of year where everyone starts getting sick with colds! We love using Clorox wipes at our house!! I keep Clorox disinfecting wipes in my classroom to keep germs away. They always smell so good and do a great job preventing the spread of germs.